One of the first things I did after returning home after our vacation last week was go out and buy fresh flowers for the house-actually, it was my husband who surprised me with tulips because he knows that home just doesn’t feel right for me unless we have fresh flowers out on display! I’ve shared some tips before for how to arrange grocery store flowers and how to make hydrangeas last longer but today I wanted to share 5 tips to help you make cut flowers last longer-because when you can make a bouquet last three weeks instead of one it really helps to justify the small indulgence of keeping fresh flowers-right? I almost always buy my flowers from Trader Joe’s at our current home in DC-their flowers are very reasonably priced and of really high quality. Most natural food stores like Whole Foods and Fresh Market also have great floral selections albeit a little more expensive. I’ve found that when I buy flowers from mass retailers like Walmart they very quickly wilt. Find your local “sweet spot” for buying flowers and don’t waste your money on the other places! 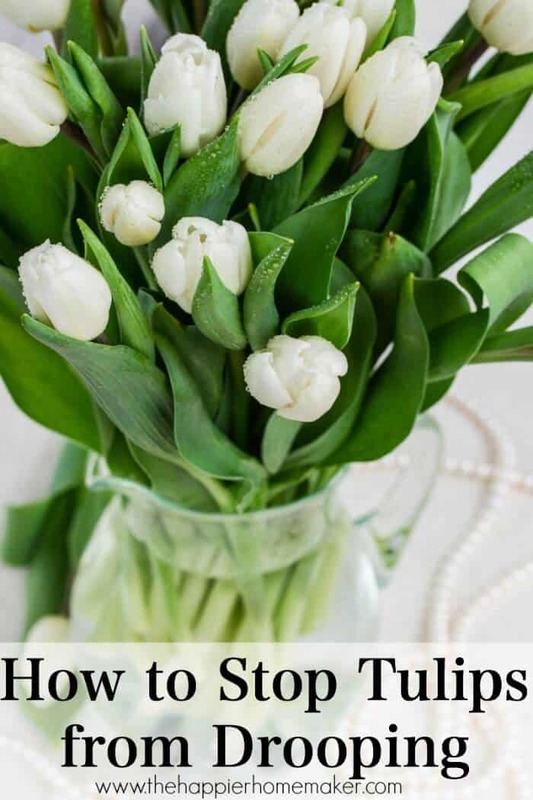 Try to check the stems and make sure the flowers are healthy before buying them-don’t buy flowers with discolored or molding stems or flowers that are beginning to wilt. When preparing your vase use lukewarm water and mix in the floral food packets that most bouquets are sold with. Have your water ready before your prep the flowers. 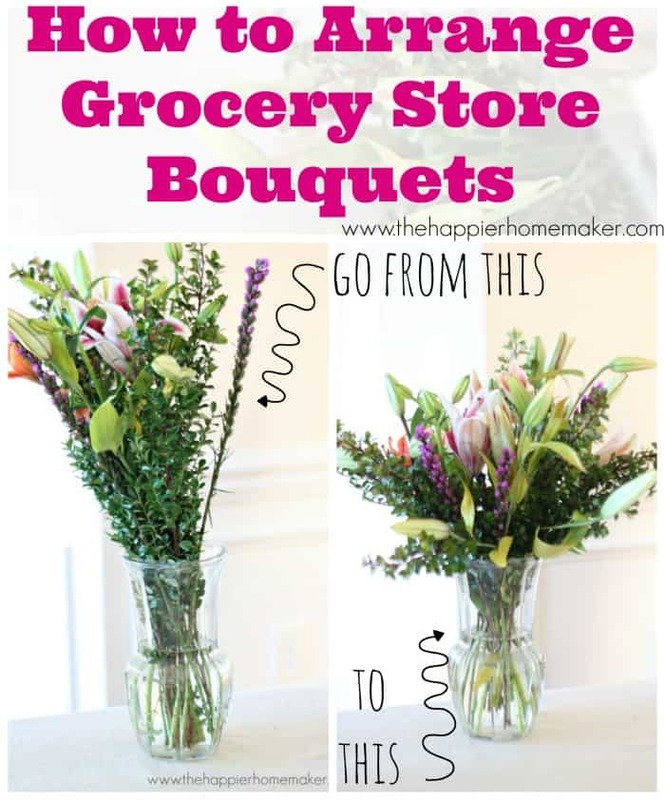 Like I discussed in my post about arranging grocery store flowers-you can’t just plunk the bouquet in the water and expect it to look good or last. Taking a few moments to prepare your stems will ensure they last a long time. 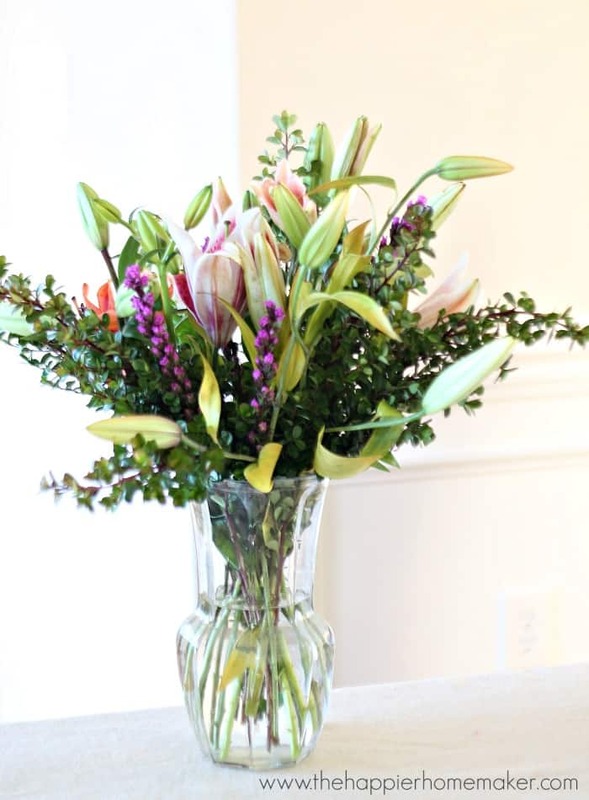 First remove the flowers from the wrapping and make sure your vase is ready with water. Then recut the stems at an angle-this ensures the stem isn’t “scabbed over” and can absorb water-the angled cut also gives it a greater surface area for the water to be absorbed. Remove any leaves that will be below the water line and immediately put the stem in water. Also, be sure to put your flowers in water as soon as possible after buying them-this isn’t the time to run a ton of errands or put the week’s groceries away while they sit on the counter…if you can’t put them in a vase right away at least put some water in the sink and set them there with the bottoms of the stems submerged until you can properly prepare them. 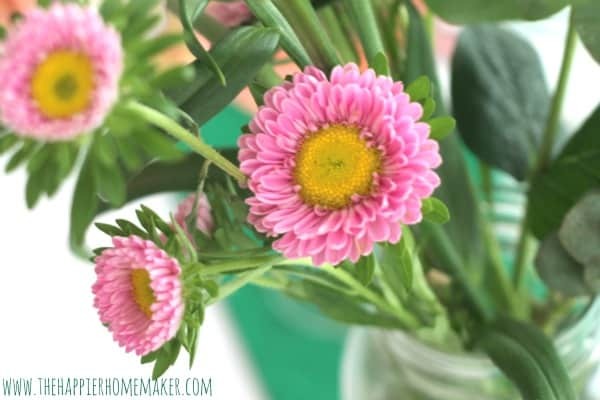 Keep an eye on your bouquet daily and recut the stems and change the water as needed-I usually do this once a week at minimum but you may need to do it more often depending on the size of your vase and they type of flower. Keep your flowers away from direct sunlight and remove wilting flowers from the vase-they will make the entire bouquet wilt faster if you leave them. Do you add floral preservative when you change the water? Hi Pamela, If I have extra on hand I do add it when I change the water-I usually use more than one bunch of flowers per vase so I stash the extra packets in a drawer for water changes. These are great tips Melissa! My husband bought roses for me for Valentine’s Day and I’m trying to make them last as they are gorgeous. Thanks for a great and easy tip,Melissa. I always cut flowers without any care even we have flowers in our home most weekends. 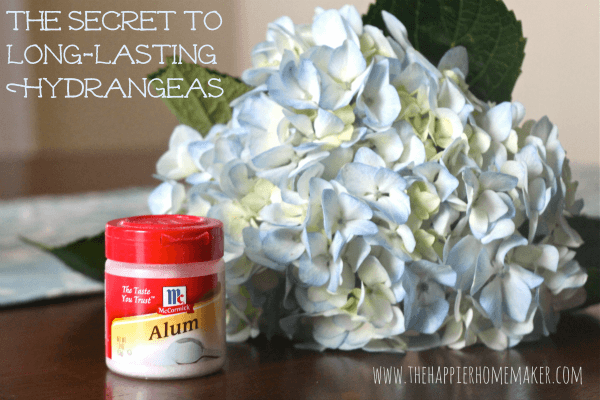 Regarding the hydrangeas, after the alum do you place them in water or just a dry vase? Great guide. I definitely always make it a point to inspect my flowers before purchasing. You don’t want to go home and discover there are very obvious flaws on your new bouquet, after all! Thanks for sharing! 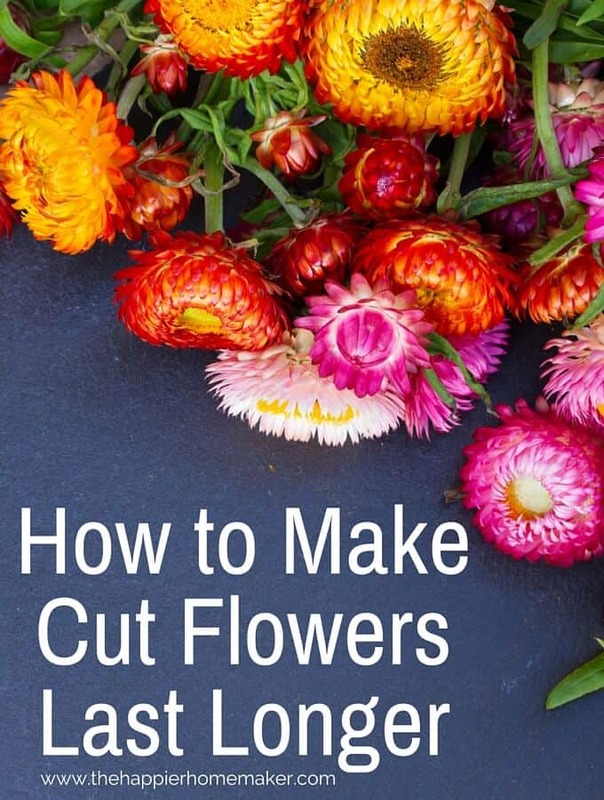 Thanks for sharing ideas about preserving cut flowers for long times. I must say thanks for sharing these brilliant ideas. I have got flowers from my wife and I am trying to make them last as they are gorgeous. Thank you for giving these brilliant ideas and tips to make my flowers last longer. If I spend money on flowers then I obviously want that my flower looks fresh for a long time. Thanks for sharing. Very nice tips…This is really helpful to make my flowers last longer. I had followed these tips and it really works. Thanks for sharing.